Do you love Breaking Bad? 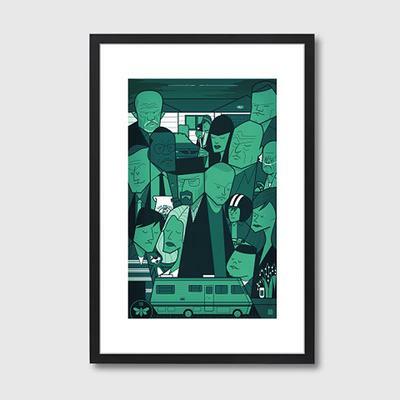 Then this amazing Breaking Bad Frame Print is just perfect! The artwork is created by Ale Giorgini and features the cast of hit TV show in caricature form. If you look closely, you'll even spot the iconic RV in there. The print is matted in white and topped with a wooden black frame. Durable and toughened perspex glass covers the front, keeping it secure and safe from damage. You can find this in two sizes: A2 and A3. Just pick the one that suits your space best and display it. You can also give this away as a present for someone who adores the shoe. It's made from premium quality materials and will make any Breaking Bad fan giddy.